The Cuban Five Are Free and in Cuba! 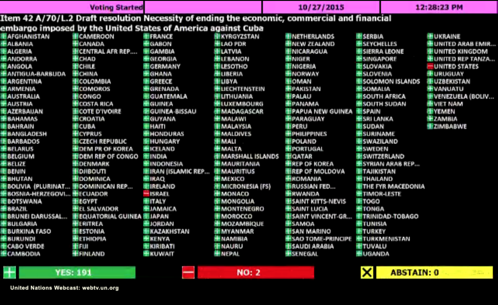 Historic high vote 191-2-0 at the U.N. U.S. "regrets" introduction of resolution; Cuba vows to reintroduce it every year until blockade ends. The Five are awarded the title "Heroes of the Republic"
"Our sole achievement is having fulfilled our duty"
secretly on the government payroll, unknown to the defense. The petition isn't needed any more; the Five are free! Contact the National Committee to get involved in the Five's freedom campaign. Find out how to start! Antonio Guerrero became an accomplished artist while in prison. View his traveling exhibit. Book a showing in your city. 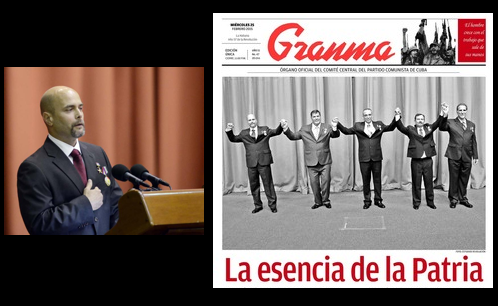 The National Committee to Free the Cuban five has uncovered substantial information about the U.S. government's secret collaboration with the media, through several Freedom of Information Act petitions. This new evidence is a vital part of the Cuban Five's current legal appeals. Research into the U.S. government's illegal propoganda operation is ongoing. Click here to download the 562-page report. By The Real News | 10:07 min. Renowned lawyer Martin Garbus, called "legendary, one of the best trial lawyers in the country" by Time magazine, has joined the team of lawyers appealing the convictions of the Cuban Five. In early June Garbus and Supreme Court specialist Thomas Goldstein, together with long-time Cuban Five lawyer Richard Klugh, filed a motion in U.S. Southern District Court, seeking an evidentiary hearing and the right to discovery on behalf of Gerardo Hernández, in his Habeas Corpus appeal. This motion relates specifically to the issue of U.S. government payments to members of the Miami media during the trial of the Five, journalists whose coverage helped to add to the already poisonous atmosphere in Miami against the Five. Full-page ad in the Washington Post! 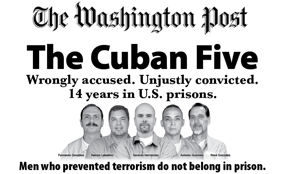 On April 30, 2012, the National Committee to Free the Cuban Five published a full-page ad in the Washington Post, where it was seen by hundreds of thousands of people. This effort to raise the visibility of the demand to free the Five was thanks to a year-long joint fund-raising efforts of Cuban Five committees worldwide. Luis Posada Carriles is the most notorious of the many Miami-based terrorists who the Cuban Five were monitoring and preventing from carrying out further acts of terrorism against the people of Cuba and others around the world. His most notorious crime was masterminding the mid-air explosion of Cubana Flight 455 in 1976, killing all 73 people on board. He is wanted in Venezuela on 73 counts of murder, and the U.S. government has been studiously ignoring the Venezuelan government's extradition request. Coordinator of the ANSWER Coalition speaks at the Posada Tribunal held in El Paso, TX on Jan. 2011, the night before the beginning of the sham trial of Luis Posada Carriles on illegal immigration charges. 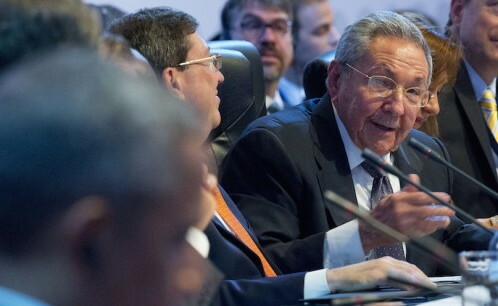 National Committee to Free the Cuban Five video | 17:13 min.